Transforming the main auditorium of the stunning Victorian theatre with a jaw dropping sound, light and audio-visual experience second to none this Halloween, the light show will feature over 100 lighting units including over 30 lasers, 5 LED visual screens and 4 towers of strobe. The 10 meter wide display will include C02 ice cannons, pyrotechnic displays and incredible live visuals, all set to the backdrop of Found’s custom built 12ft high ‘Day of the dead’ Skull, an imposing centerpiece hand built for Halloween 2014. Completing the programme for Maya Jane Coles & Friends on Saturday 1st November, global arts collective The Weird & The Wonderful will take over room two. 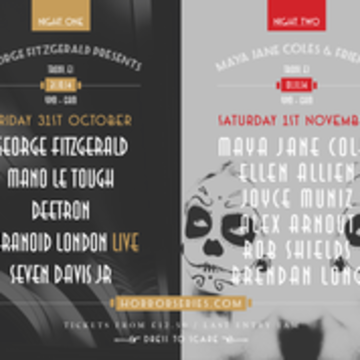 Counting some of the planet’s most creative music and arts talent, including Maya Jane Coles herself as well as Magda, Dense & Pika, Engine-Earz Experiment and artist, Harriet Horton, The Weird & The Wonderful will bring a dynamic dancefloor experience to Halloween celebrations. Opening at midnight, the electronic showcase will feature infamous Found residents The Menendez Brothers, classic house and Detroit Techno advocate, Anna Wall and the sounds of rising London producer, Wax Wings. Room two will feature some very special Halloween performers, turning this intimate loft at the Troxy into a den of darkness, with some very special surprises. Adding the game-changing main room production Found & Maya Jane Coles will be calling on some mysterious creatures of the night to bring a haunting set of dark and twisted performers to The Troxy. Set to scare and amaze! Promoting a ‘Dress To Scare’ theme, Found encourage party-goers to don their scariest Halloween outfits across the weekend for what is shaping up to be a definitive, not-to-be missed event. Ahead of his main room set for Maya Jane Coles, talented rising producer Rob Shields has given Found a free download of ‘Peru Winter’ from his five-track EP ‘Autocalm’ released on Monday 20th October.